After you import PowerApproval, you will notice two new security roles in your CRM. Each user you want to be able to have some level of use for PowerApproval will need one of the security roles below. 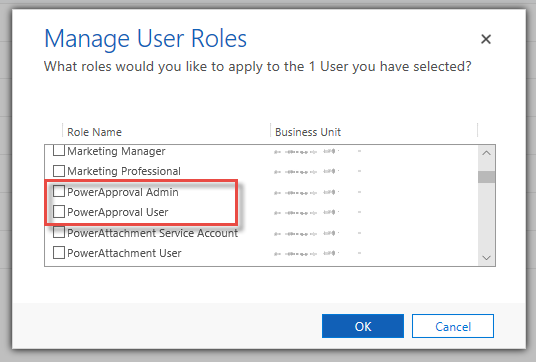 PowerApproval Admin: This security role needs to be assigned to any user who will be creating or updating the Approval Entity Lists and setting up new approval processes. PowerApproval User: This security role will need to be assigned to any user that will be using PowerApproval. 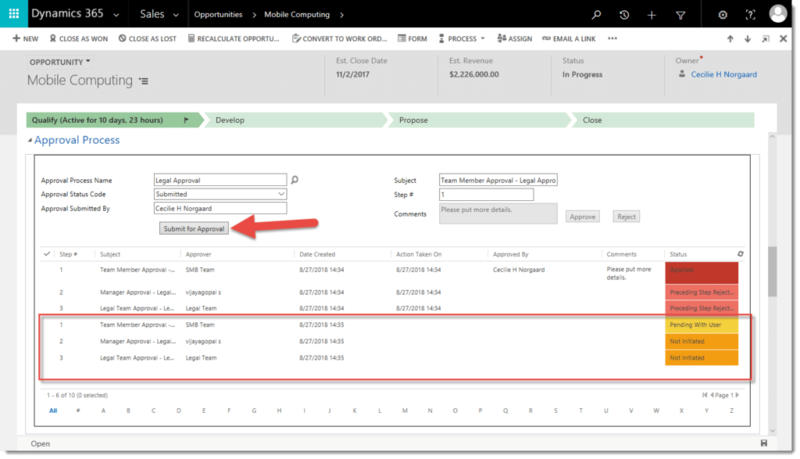 After importing PowerApproval, you will see a PowerPack tile added to your Dynamics 365 sitemap, with a number of entities under it. In order for PowerApproval to run on a specific entity, you need to create an “Approval Entity List” record for the entity. 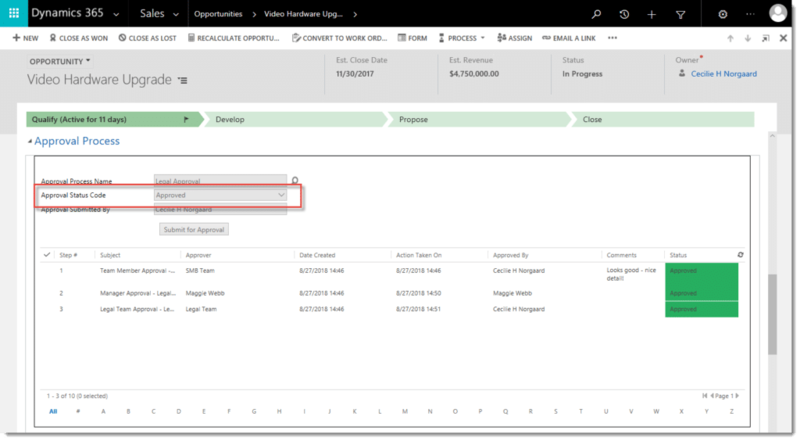 For example, if you’d like an approval process to run on the opportunity, you would need to create an Approval Entity List record for the Opportunity entity. Please note that you must use the schema name. After saving, to enable the process, click Register. If at any point in time you’d like to disable this entity for approval processes, you can come back and click “Deregister” in the ribbon. Note: You’ll have to be a system admin, system customizer or PowerApproval Admin to save this record. Next, you’ll want to create an Approval Process. Approval Processes can span across entities, or you can have a unique approval process per entity. Please note that you cannot run more than one approval process per entity. Name the record, add a description if you’d like, and save. To add approval process steps, click the + sign in the subgrid. Subject: The title of this approval step. Please note that this will be used to name the approval step instances, once an approval is started. After saving the approval process step, the name of the approval process will be appended to the subject. For example, if you’re approval process was named “Legal” and your approval process step was named “Manager Approval”, then, when saved, the subject will become “Manager Approval – Legal”. Step Number: Define a step number. The number has to be a whole number, and steps cannot be skipped or repeated. For example, you can’t use 1 for two approval process steps within the same approval process. Note: All approval steps are sequential, so the first step has to be approved before the second step, etc. User: A specific user has to approve this step of the approval process. Manager of Previous Approval Step: The manager of the user defined in the previous step has to approve this step. Manager of Owner of Record: The manager of the user who owns the record the approval process is started on. Manager of Record Submitted by: The manager of the user who started the approval process. Team: A user that’s part of a specific team has to approve this step. Approving User: If you’ve chosen a user to approve this step, you’ll need to define a user in this field. Approving Team: If you’ve chosen a team as the approver for this step, you’ll need to define what team in this field. 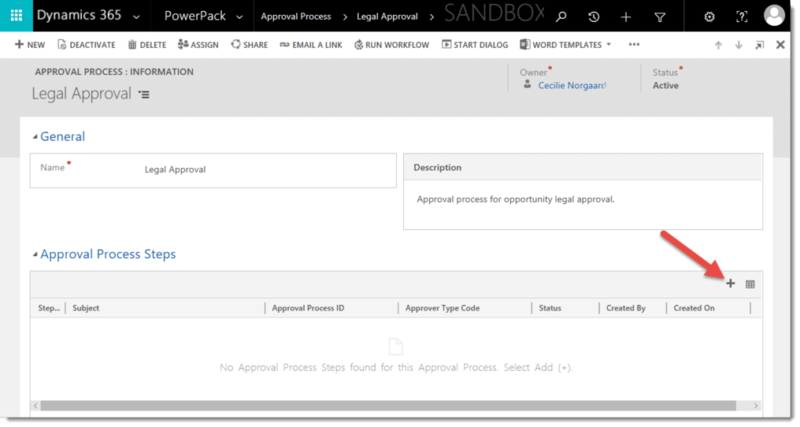 After you’ve finished defining all of your approval steps, you’re ready to start using PowerApproval! If you’d like to define specific rejection reasons that approvers can choose from, you can create Approval Rejection Reasons. These reasons will make it easier to report on why approval process step instances are being rejected. Rejection reasons will appear on the approval process step instance, if the approver is choosing to reject the step. This is NOT required to complete the rejection. 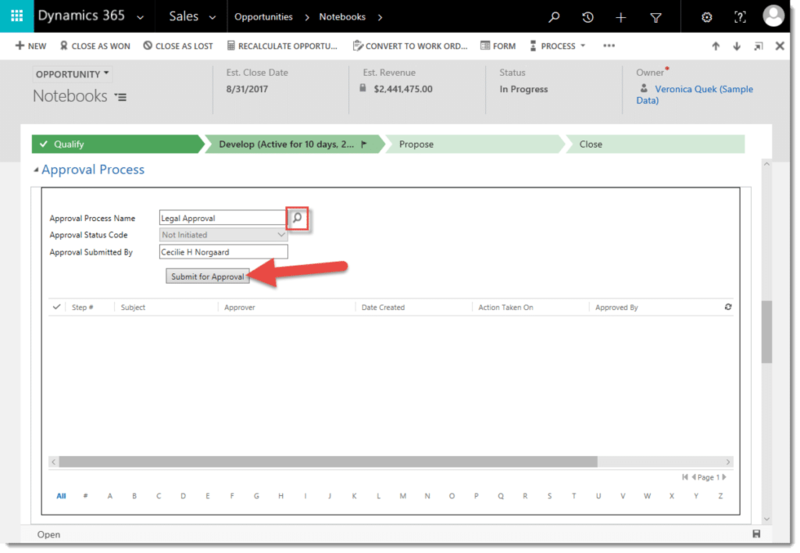 In order to start using PowerApproval on an entity, you have to add the PowerApproval web resource to the form of the entity you’d like to use it on. To do this, navigate to the form customizer in Dynamics 365, and add the “poappr_/ApprovalStatus.html” web resource to the form. Note: You’ll want to format the web resource to be 20 rows, so no scroll bar is displayed on the web resource. To start the approval process on a record, navigate to the PowerApproval section, and select the lookup icon. This will bring up all possible approvals to choose from. Select the approval process you’d like to start, and click “Submit for Approval”. A pop-up will ask you if you’re sure – click ok. Note: Only one approval process can run per record. After a few seconds, the approval process steps will load, and you can now make your way through the approval process. The approval status code will initially display as “Submitted”. Step #: The approval process step number. Subject: The title of the approval process step. Approver: Who is allowed to approve/reject this step. Date Created: When the approval process was originally submitted. Action Taken On: When the step was approved/rejected. Approved By: Who the step was approved/rejected by. Comments: If any comments were entered, they will be displayed here. Please note that comments are limited to 2,000 characters. Rejection Reason: If the step has been rejected, you have configured rejection reasons, and the approver has selected a specific rejection reason, it will be displayed here. Status: The status of the approval step. Either Pending, Approved or Rejected. If you are the approver of a step, select it, enter your comments in the fields that appear towards the top right of the approval section, and click either Approve or Reject. If you are not an authorized approver of this step, the comments box, and the options to approve or reject will be grayed out. If a step is approved, the process will move on to the next step. If a step is rejected, the status of that step will say so, and all subsequent steps will also be rejected. Note: Once a step is approved or rejected, there’s no way to go back and change the approval status. You would need to restart the approval to change the status. To restart an approval process, resubmit for approval. This will add another set of approval step instances under the initial set. Once all approval process step instances are approved (or if the process has been rejected), the status of the overall approval process will change to Approved or Rejected. As a user, you can enhance PowerApproval by creating custom workflows, dashboards or views make users aware of records awaiting their approvals, or give managers an overall view of records waiting for approvals. A few examples are outlined below. If you’d like to add email notifications, to notify users either that an approval is waiting for them, the approval process has been completed, or an approval process has been initiated, you can create a workflow that sends an email to that user, based on either the Approval Process Step Instances (to notify on specific steps), or the Approval Process Status on the record the approval is on (to notify on start/end of an approval). As a user, you can create a view of all records that are ready for and awaiting your approval. To create a personal view, navigate to advanced find and choose “Approval Process Step Instances” in the Look For dropdown. Then filter only where your user is in the Approving User field, or where your teams are in the Approving Team field, and also where Status Reason is Pending with User. Make sure to add the “Regarding” column to the view, so you can see what record is awaiting your approval and Save the view. You can create similar views for records you’ve already approved, records awaiting your team’s approvals, etc. After creating the views you desire, as described above, you can create dashboards that display these views – and even create charts, based on the date the step or process was approved/completed, etc. to add to your dashboard. Before uninstalling PowerApproval, you will need to delete all Approval Entity List records, Approval processes, and remove the PowerApproval web resource from any forms it’s been placed it on. 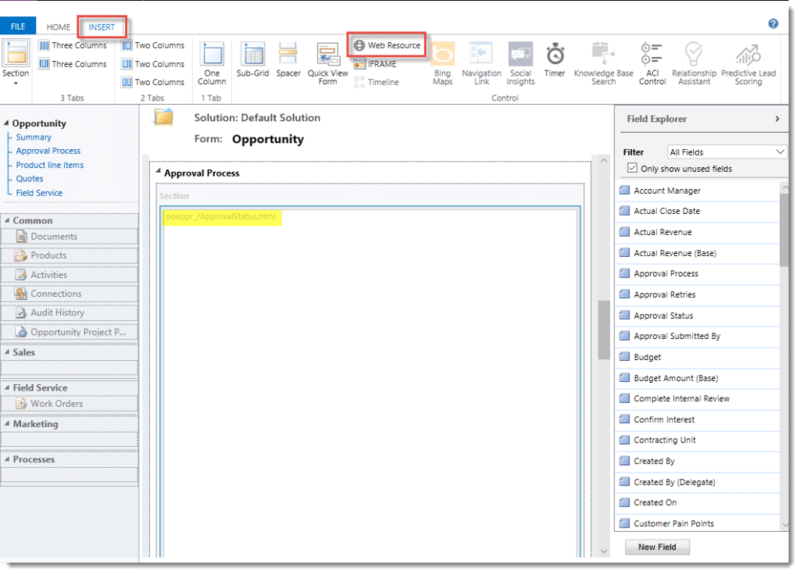 Then, uninstall as usual, by navigating in Dynamics 365 to the solutions list, selecting the PowerApproval Solution and deleting. Deleting the solution will remove all existing PowerApproval related records in your system and all information related to the PowerApproval add-on. If you do not want these records to be deleted you can simply unsubscribe from PowerApproval but leave the solution in your system. Thank you for your interest in PowerApproval, should you choose to subscribe you will be charged $1/enabled CRM user/month. If you have any questions or run into any issues with PowerApproval, our friendly support team is here to help!